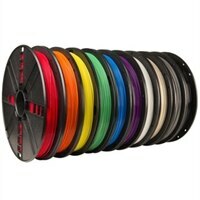 MakerBot 10PK True Color PLA Filament Large Spools All True ColorsMakerBot PLA Filament is the best and most consistent filament for the MakerBot® Replicator® 2 Desktop 3D Printer and Fifth Generation MakerBot® Replicator® 3D Printers. Manufactured and in-house tested to conform to the highest standards. Every filament color is comprehensively quality tested at both high (100 micron) and medium (200 micron) layer resolutions on a MakerBot Replicator 2 to verify that the filament will perform every feature that MakerBot® MakerWare™ - and the Prepare feature of the new MakerBot Desktop app - offers and will reliably slice and print every type of printing (tight corners, long and short overhangs, floors, ceilings, etc.). MakerBot’s True Color 10 pack bundle is a new product offering that allows Dell customers to purchase 10 spools for the price of 9. MakerBot PLA Filament is the best and most consistent filament for the MakerBot® Replicator® 2 Desktop 3D Printer and Fifth Generation MakerBot® Replicator® 3D Printers.